Paloma River Lodge – Fly Fishing Heaven! The best thing about the Paloma River Lodge is how small it is. Only 4 rods per week, private rooms, river out the back door. Let that sink in – only 4 fly fishermen per week. The entire interior of the house, all 1980 sq. feet, has been gutted and reconstructed with 4 very spacious bedrooms with private baths and queen size beds for the clients. You get a private room (couples are allowed to share rooms!) 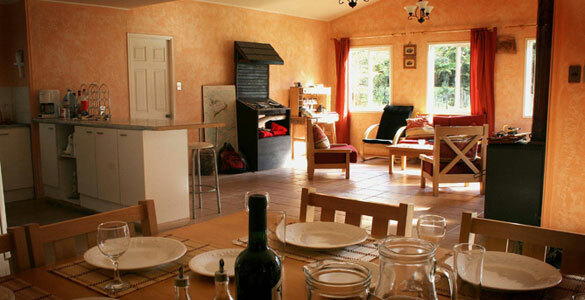 The kitchen is open to view from the dining room and the large common room, where fishing stories will be shared over a large selection of Chilean wine. While at The Paloma River Lodge you will be fishing with either streamers or dries, with about 80% of your fishing done with dry flies. 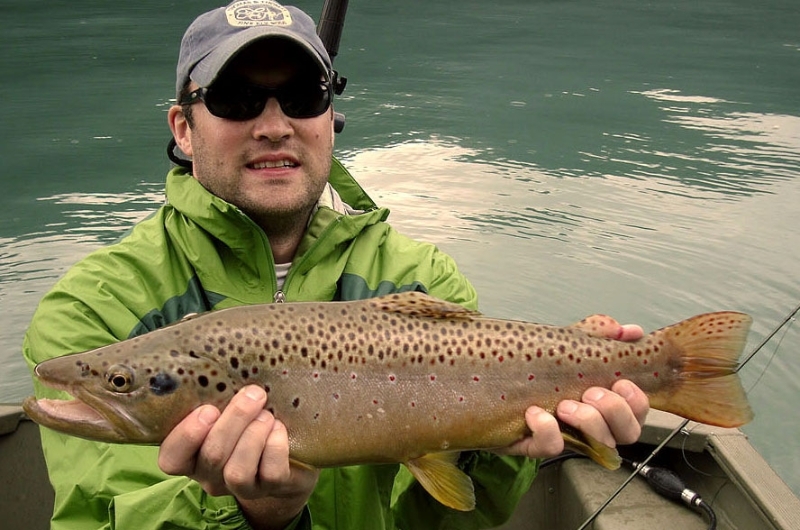 Dry flies that are big and ugly will work best at this lodge. Because of the six different types of beetles in the area, the trout are accustomed to pounding large bugs on the water surface. This is the dry fly fisherman’s paradise in every respect, since most of the dries that we use are between sizes 4 and 10 all summer long. Streamers are productive all year round but their key roll is in the lakes and during the fall season. 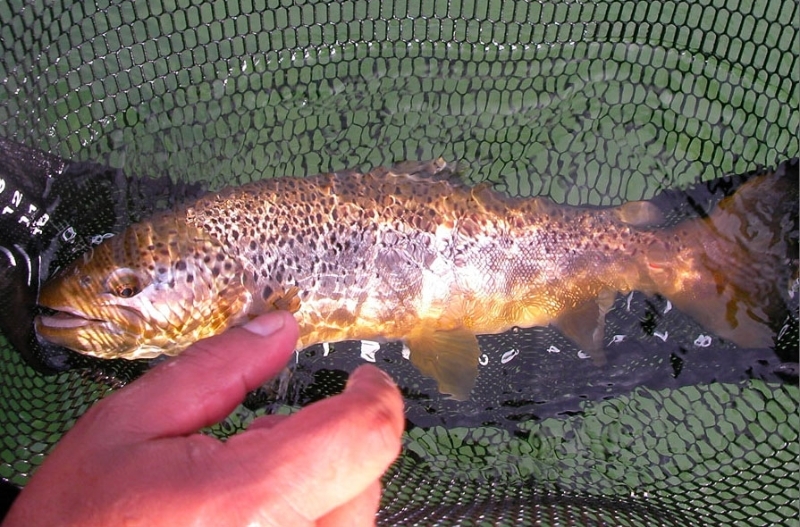 Nymphs have typically not been used in the rivers but they can be productive in the crystal clear lakes when sighting fish. Fish size ranges from 1-10 pounds with most fish 15-20″ , a few every day 20″ – 25″” and a few really big boys every season are brought to hand. 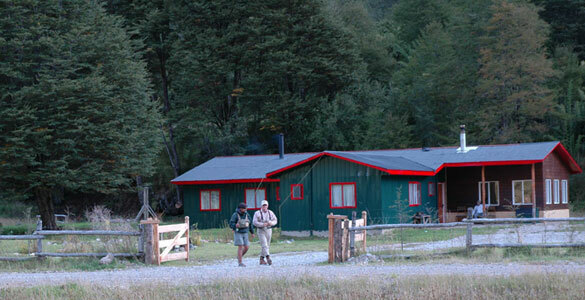 The lodge is located in the Paloma River valley, just a one hour 25 minute drive northwest from the airport at Balmaceda and a one hour 30 minute drive southwest of Coyhaique. We are just minutes from our fishing destinations, with a walk and wade trip starting just 200 yards from the front door of the lodge itself. 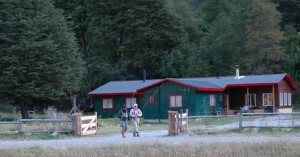 We are well off the power grid, deep in the Patagonia, but have our own generators and small hydro turbine. 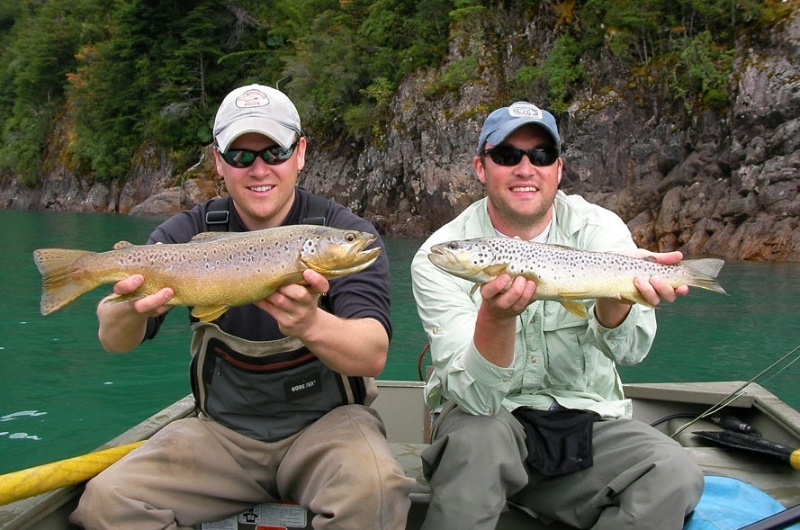 Fly fishing is our main goal, with very short transfer times to and from our float and wade trips, average time 15 minutes, we spend our day on the water, not getting to it. 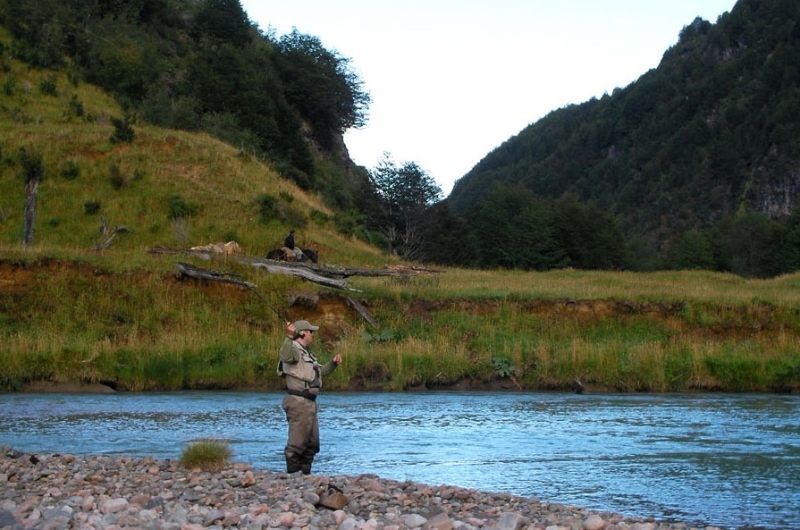 We will be happy to take clients to visit Coyhaique, but believe that fishing lodges should be located on fishing waters, not in cities. 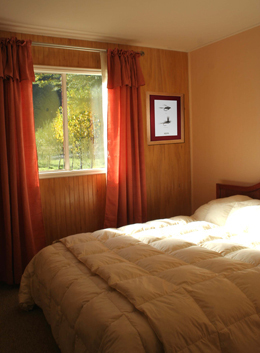 The lodge is a very comfortable 1980 square foot construction. There are 4 spacious client bedrooms, each with a queen size bed and private bathroom. A maximum of 4 rods per week will be sold, so each client will have his or her own private room, couples may share. 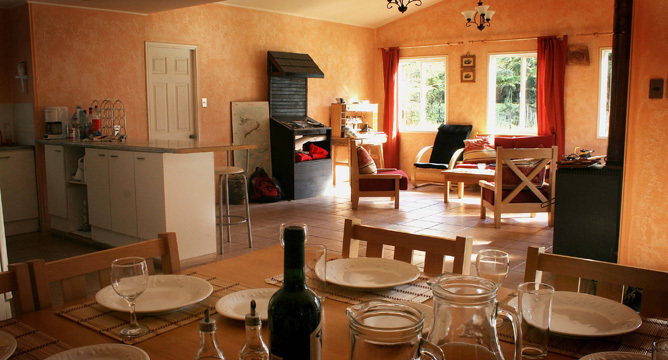 The kitchen is open to view from the dining room and the large common room, where fishing stories will be shared over a large selection of Chilean wine. Many of you know about the fishing available at the lodge, having been open and attending 8 anglers per week for years, plus the recent stories that have been written about the Paloma River and it’s tributaries. 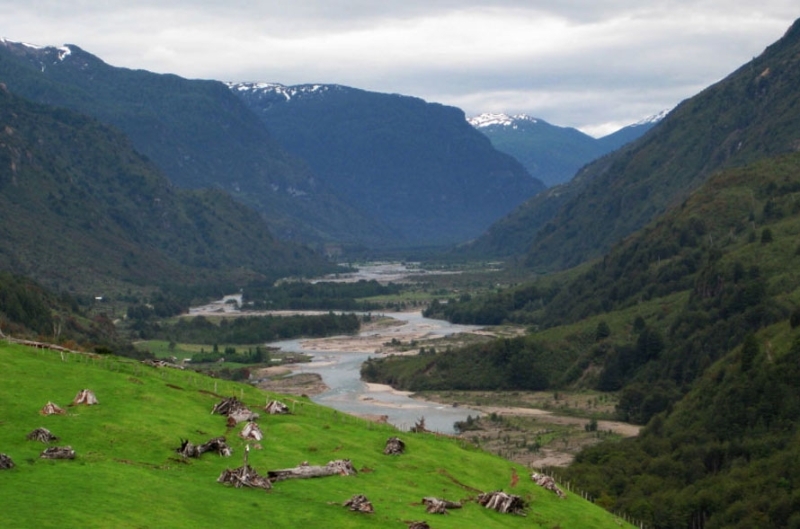 In addition to the rivers and lakes that are well known, some additional access points have been secured through local farmers that are long time friends of Felipe. The lodge has two Aire Super Puma 14′ self bailing rafts, with rowing frames, for the float trips and one all welded 17′ jet sled for the bottom of the Paloma river, plus another boat located at a key lake fishing access. 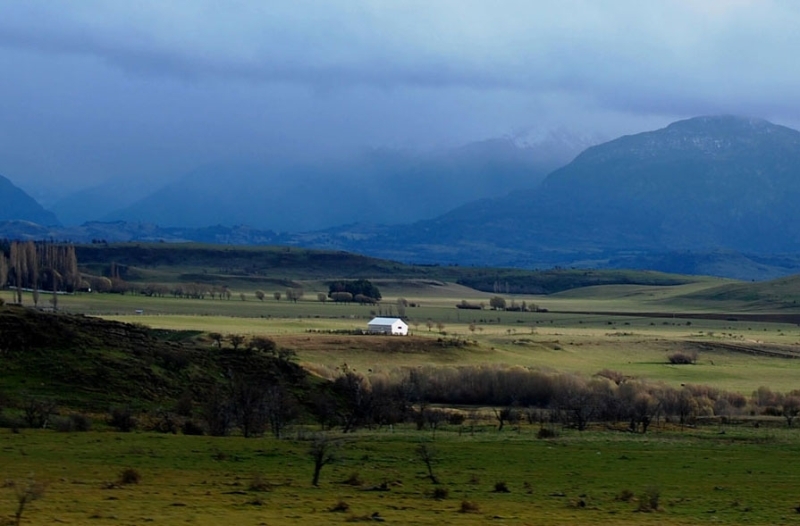 Paloma River Lodge is a partnership between Felipe Carrasco and Paul Kinney, aka Coyhaique Outfitters, to purchase and operate The Paloma River Lodge. Felipe, born and raised in Coyhaique, has been fishing the surrounding rivers since being a young teen, he even worked at the Paloma Lodge as a camp hand when the lodge was first opened in the early 90’s. 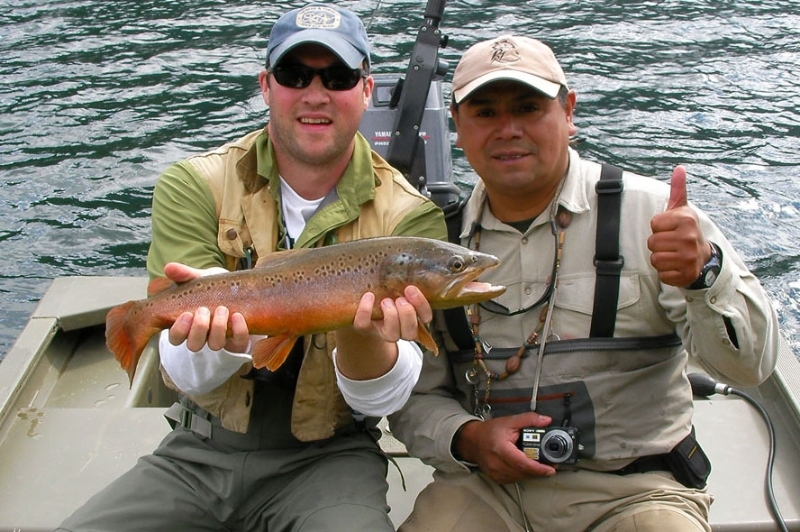 Felipe speaks fluent English and loves to guide his clients on sight fishing trips. Paul moved to Chile in January 1997 and has lived in south Chile since. 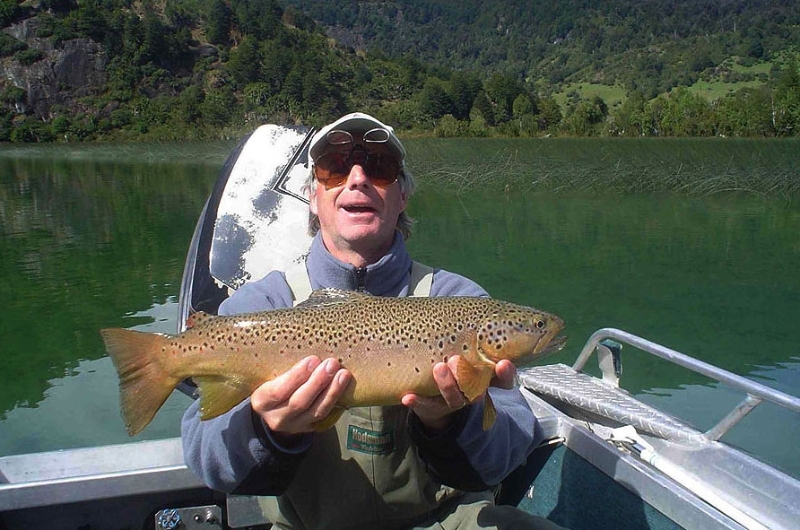 During these years he has overseen the construction and development of the two better known and more luxurious lodges in Chile, and has developed a passion for fly fishing. Both are exited to have the opportunity to own and operate the Paloma River Lodge. They know what a great fishery it is and the rewards that a client can achieve dry fly fishing, in the pristine environs of The Paloma River Valley. They will host only 4 rods per week, because their philosophy is to maintain a small group size with personal service and friendly atmosphere. While at The Paloma River Lodge you will be fishing with either streamers or dries, with about 80% of your fishing done with dry flies. 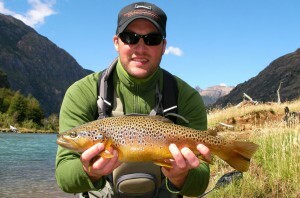 Dry flies that are big and ugly will work best at this lodge. Because of the six different types of beetles in the area, the trout are accustomed to pounding large bugs on the water surface. This is the dry fly fisherman’s paradise in every respect, since most of the dries that we use are between sizes 4 and 10 all summer long. Streamers are productive all year round but their key roll is in the lakes and during the fall season. Nymphs can be productive in the crystal clear lakes when sight fishing. Anglers that can cast 40 feet will be able to reach most of the fish in our rivers. We have a very good mix of float fishing and walk and wade fishing. For the clients that like a bit more adventure, we offer a horse back trip, to access a high mountain stream, for a day full of action using dry flies and light weight rods, 4 weight recommended. We also use a jet boat to access some hard to reach areas in the Paloma River and a small lake with very large trout. On the Paloma River, normal-size trout are between 15 and 20 inches. 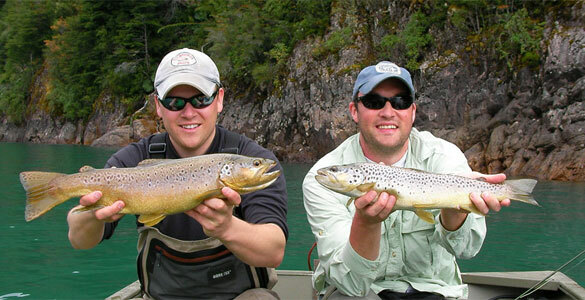 There are many over 20 inches and it is not uncommon to get several chances at brown trout over 24 inches. 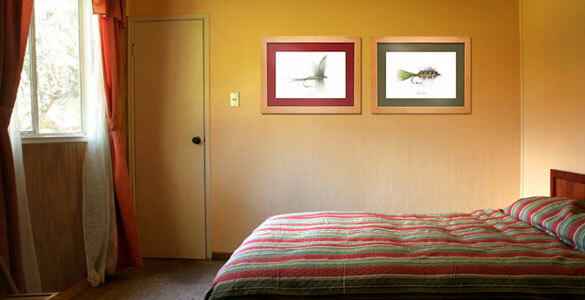 A good day of fishing here will leave an everlasting impression on even the most experienced of anglers. 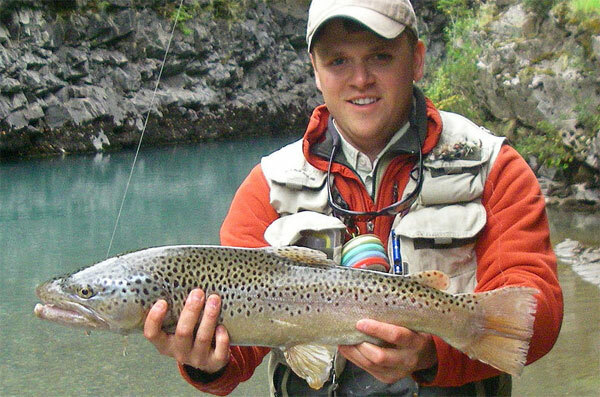 The Paloma River is very well known for providing stellar days of fishing and personal record trout being taken on dry flies. 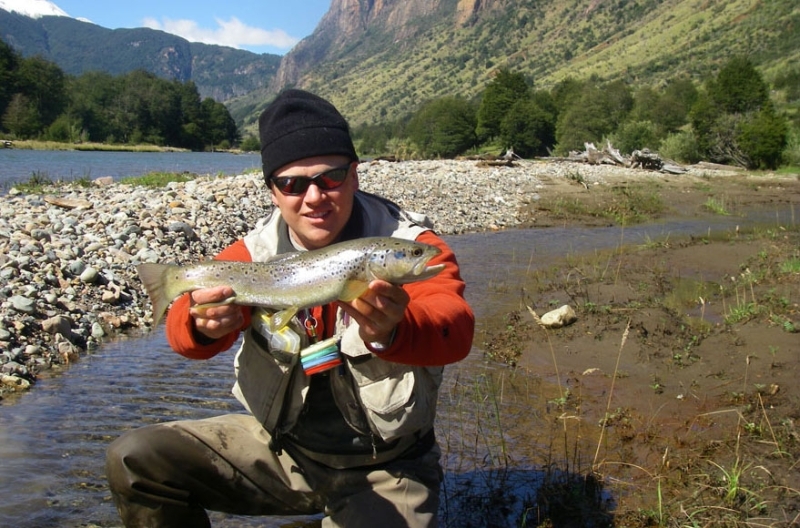 On The Magote River, the trout are smaller, 10 to 16 inches, the action is fast and furious, small dry flies and a light weight rod, will provide you with a day to remember indeed. With 3 major lakes close by, we can go for some very large trout, if that is what you wish, sight casting to large crusing fish along the shores. With private access to a couple springs creeks, we can walk and wade for some technical stealth fishing, with small dry flies to large hidden browns. 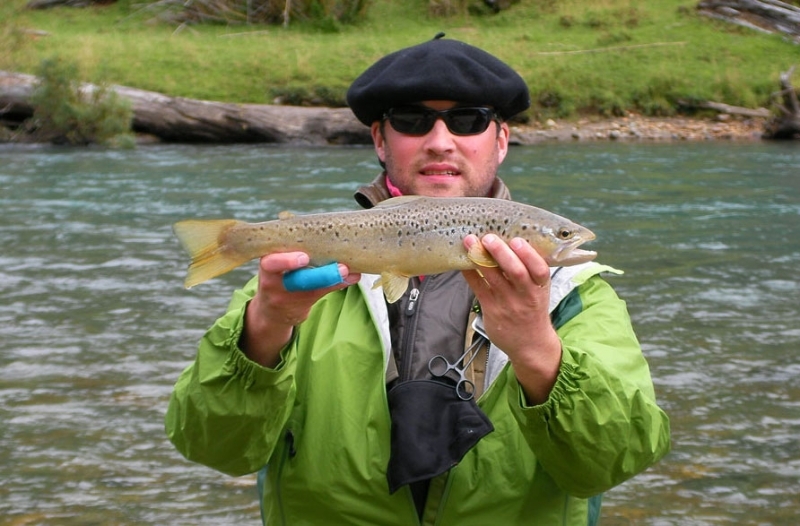 Close to the lodge we have an abundant amount of wild trout in a wide range of terrain, providing great fishing for all, no matter the style of fishing you like to do. This is the farthest South in Chile that we’ve fished. 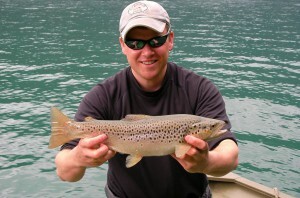 Paul Kinney runs a small and excellent lodge – one of the very few places in the world with a great river within walking distance, with tremendous brown and rainbow trout. Wonderful scenery and attractive place for couples. 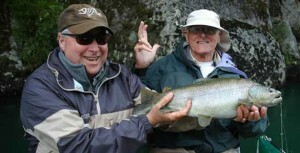 We thoroughly enjoyed our fishing there with Paul and his guides. Best trip of my life you folks are the most wonderful people I’ve even met. This was an experience I’ll never forget. The country is breathtaking and the fishing is great. Thanks so much for our time here at the PRL! We enjoyed our stay and we hope to be back soon. I really enjoyed the sight fishing we did on the big river. Thank you so much for a wonderful week at Paloma River Lodge. From the great fishing to the 5 star cuisine, everything could not have been better. I look forward to my return visit. Please give my regards and best wishes to all the staff for a truly superb job and an experience I will not forget. Best of luck in the future and tight lines! Many thanks to Paul and his team for making a really wonderful fishing experience. To Ivonne and Carola for the great food and service. To Carlos for his dedicated guidance made a big difference. Also to Joanna and Alfredo for his hospitality and unforgetable “cordero al palo”, potatoes, sopaipillas, etc. Best wishes to you all and hope to see you again soon. The experience here at the PRL was excellent. Your guiding skills are world class… You really are an excellent guide with a great attitude and good ability to teach those who may need a little instruction. The Paloma River is absolutely beautiful and full of beautiful big brown trout. Your team is very professional and take very good care of your clients. The food was outstanding, the fly fishing experience among the best in the world, both of which were only exceeded by your team’s excellent care and good company. I really plan to come back soon! Muchas gracias!!! the best of Chile, the Paloma River Lodge. 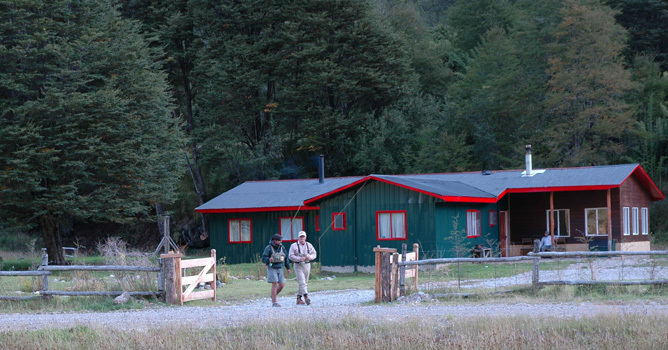 Lodge Staff will meet you at the Balmaceda airport and drive you to the Paloma River Lodge. Once settled in at the lodge, we will go over the plan for the week, help anyone brush up on their casting, get your gear ready and then you may rest or explore the possibilities of an afternoon of wade fishing. Cocktails will be served at 7pm, featuring the Chilean favorite, Pisco Sours, followed with our evening meal and Chilean wine. River we will wade fish along the upper Paloma River until we reach our boat on the Desierto Lake. 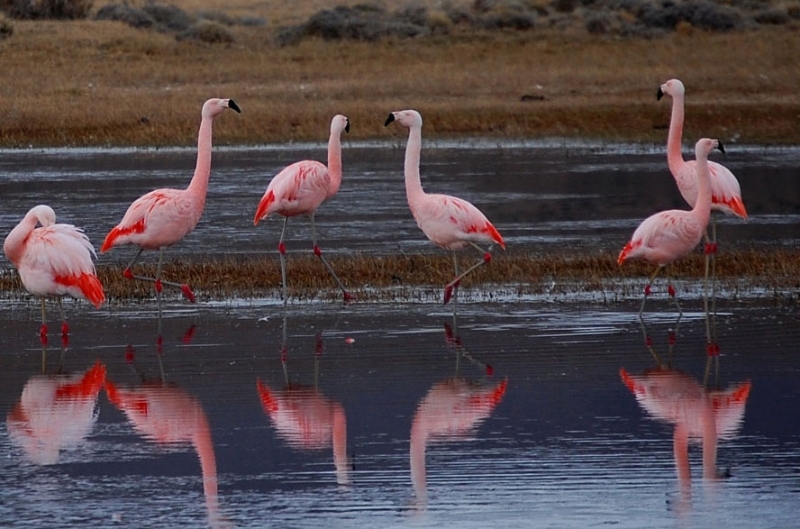 We will then motor up to fish the outlets of Lake Desierto and Azul. Browns here average 14-19 inches with a good number above that size. River where we will mount our horses and head upstream about 1 hour and begin a day of great wade fishing for many trout in the 10″ – 14″ range. The Mogote River has the largest population of fish in our area, which means lots of action on dry flies. Some fish up to 18″. You may want a 4 weight rod today. A 5-minute walk will place us at the drift boat for fishing the Paloma River in front of the lodge. These browns love our size 4 Big Ugly dry fly. 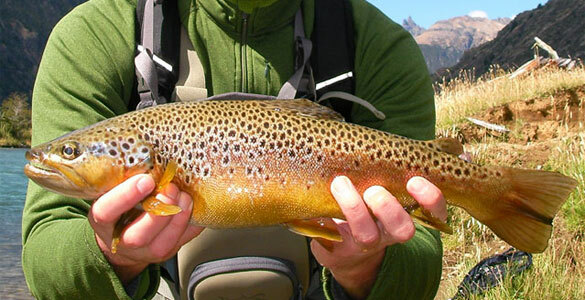 The average brown trout on the Paloma River will range from 16 to 20″ with a chance at a 22″ or bigger fish. the middle stretch of the Paloma River. 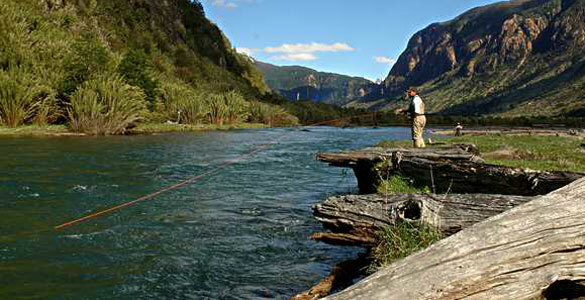 On this stretch we have many channels to wade fish, especially the already famous “El Loco” and Jumping fish channels. Today we will start off at one of the private access spring creeks, then walk over to the Paloma River to fish an isolated stretch of river. After lunch we will wade fish up to the river and cross to hit another small spring creek. 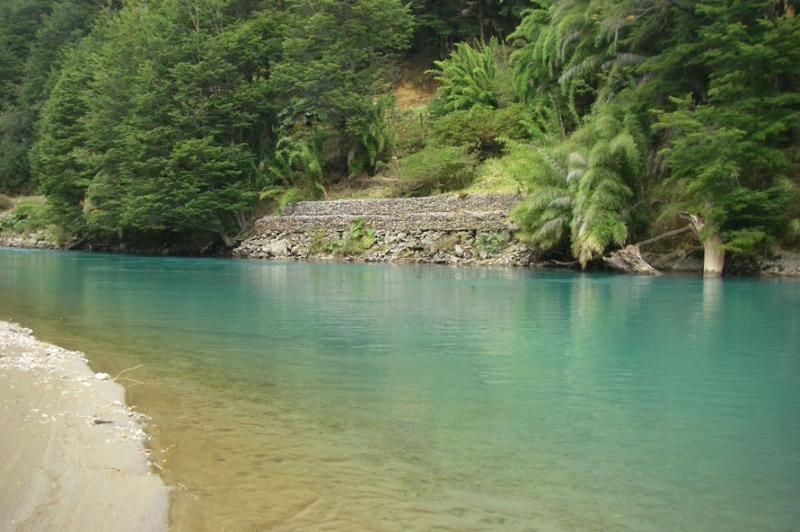 We will have an opportunity to do some sight fishing in these gin clear waters. Today is your chance to revisit your favorite piece of water for another go at that big one that got off earlier in the week, or maybe try another stream of Felipe’s choice. 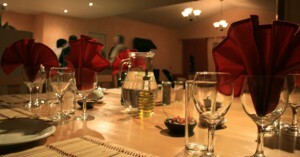 This evening we are all invited to Alfredo’s for a whole lamb, roasted Patagonia style and typical Chilean fare. A “FAREWELL” breakfast and the return drive to the airport for a safe flight home. We suggest getting all flights in and out of Balmaceda around 1 pm. #2 Floating with 8-15 fast sink tip (Type 6) 9 ft leaders with 5-12 lb. for floating setups, 3-5 foot leader 10-15 pounds with the sink tip for streamer fishing tippet. Bring some of your favorite big and ugly dry flies or streamers with you, they will work! 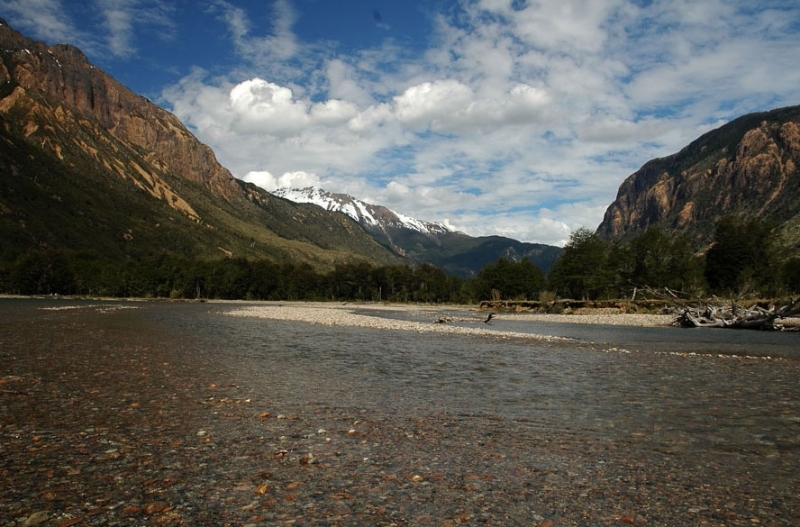 Prices Include: Accommodations at The Paloma River Lodge, with private room and private bath for 7 nights, guided fly fishing for 6 full days (catch and release), transfers between Balmaceda airport and lodge on regular transfer days, all meals, wines, beer and beverages. Prices quoted are per person and in US dollars. 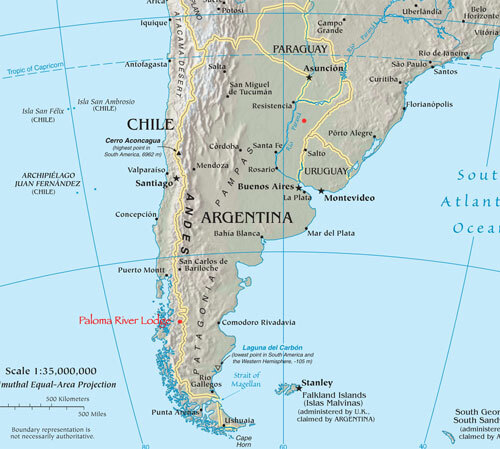 Prices do not include: Air transportation to Balmaceda, Chile; trip insurance, fishing equipment, flies, gratuities, phone calls, fishing license. The fishing season officially opens on the second Friday in October and runs until the first Sunday in May. 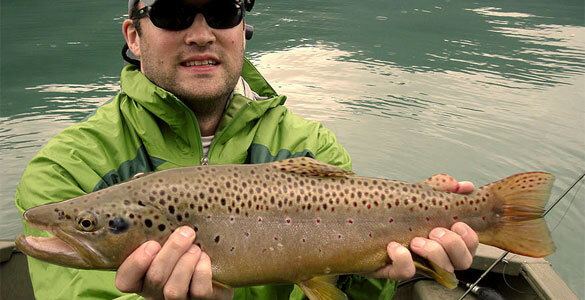 The best dry-fly fishing generally occurs from December to the end of March, although Oct. and Nov. are great spring months, and very large trout on the move can make an angler’s dream come true. March brings cooler mornings and evenings and the rivers reach their lowest water volume, but the cooler days bring the large fish out of the lakes and into the rivers for spawning. The pre-spawn streamer fishing can be incredible from mid March to late April. Those clients that want lots of big fish, will endure fishing the shorter days in April, to have an experience of a life time, going after very large trout, with large dry flies. Please take a look at the photo and video galleries related to the lodgee. 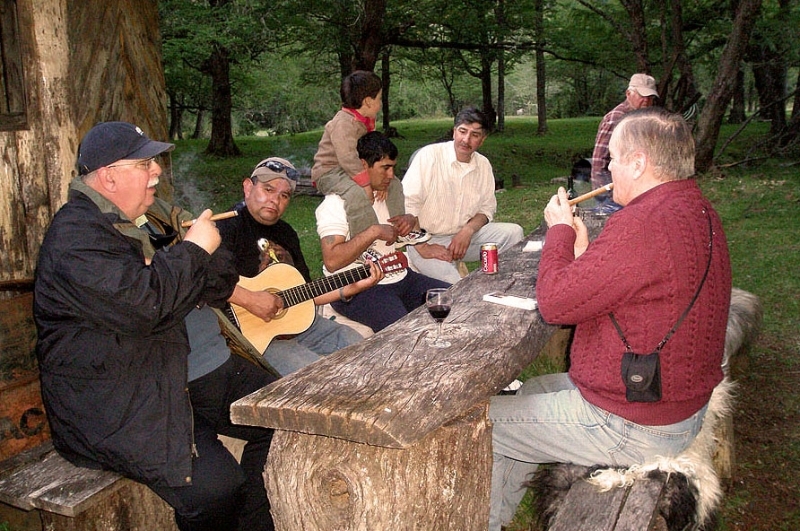 For non fishers there is not much to do unless you just like being out doors and exxperiencing the wonderful culture found in Chile. 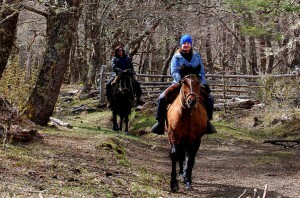 Horseback riding may be the one exception to that rule! 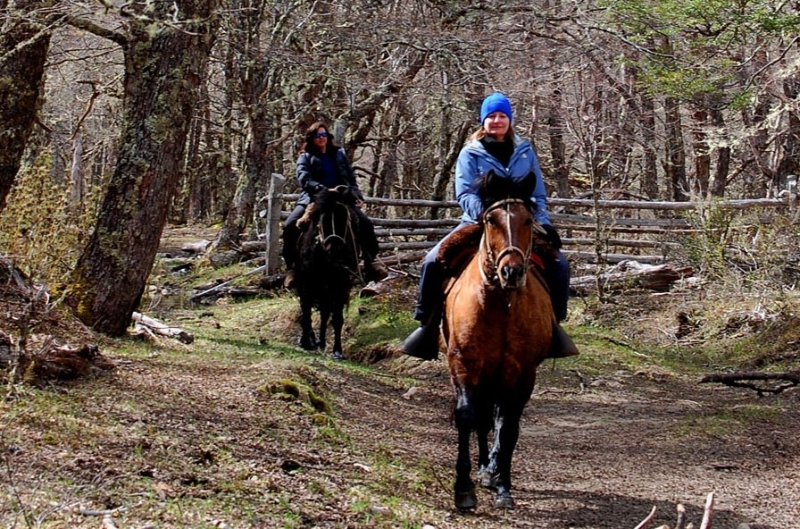 If you need a more active vacation for a non fishing friend then I would look at Yan Kee Way Lodge to the north of Paloma River Lodge, closer to Puerto Montt. 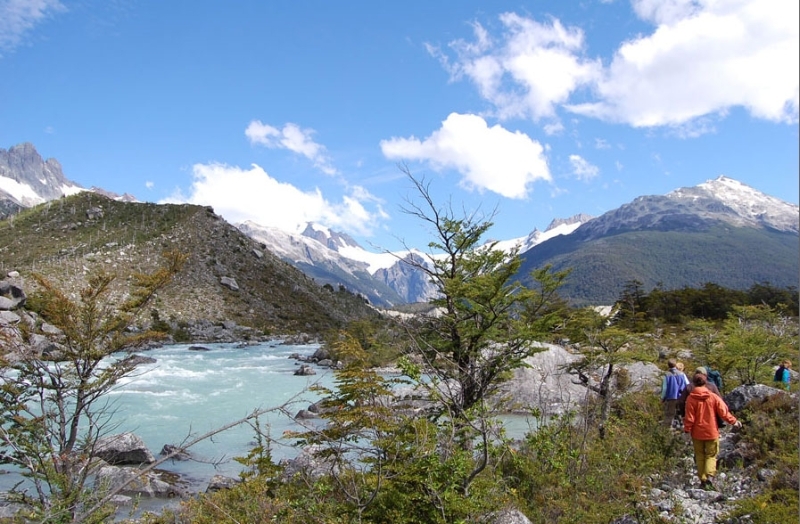 To Navigate to Yan Kee Way use the main menu at the top: Choose the tab Freshwater Trips> Chile> Yan Kee Way. Air Travel: Guests fly to Santiago, Chile and typically overnight there to relax and spend a day touring the city and its nightlife. 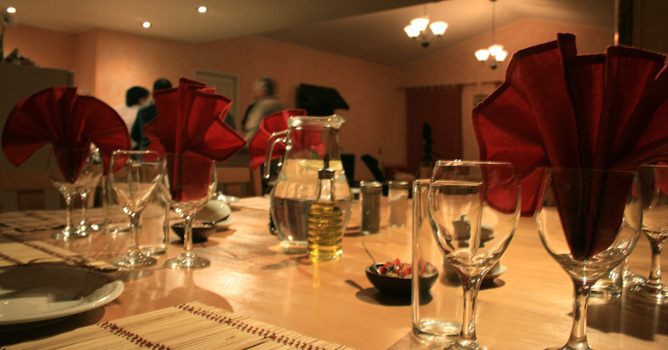 The Lodge can then be accessed from Santiago via commercial airline to the local airport of Chaiten. 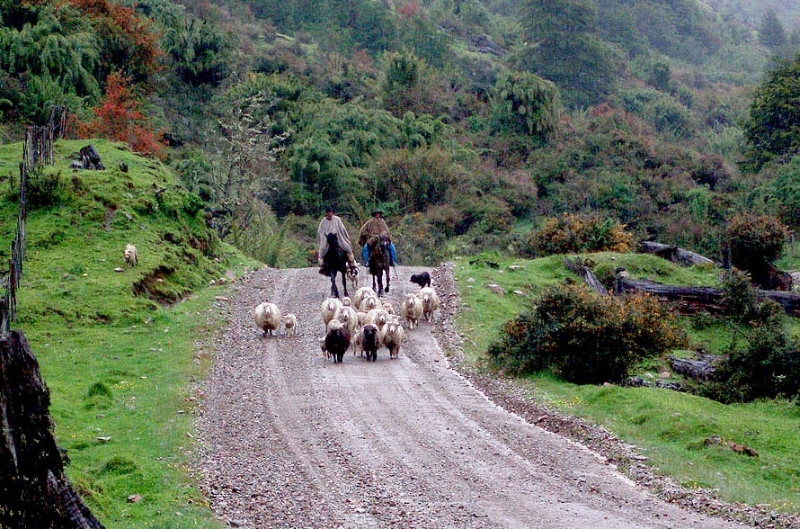 From Chaiten you will be transferred to the lodge, by a lodge representative, via a 4 minute hour van transfer. 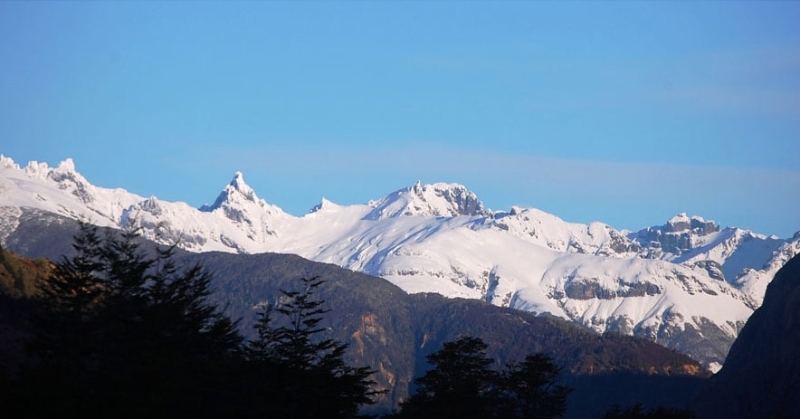 Passport and travel Documents: You will need a valid passport to travel to Chile. No visa is required for U.K or U.S.A citizens, other nationalities should check with their local consulate.